An artist created a stunning image of the entire observable universe using NASA images based on astronomical surveys provided by Princeton University. It’s quintessentially geocentric – with Earth’s solar system at the center. The South American artist and musician, Pablo Carlos Budassi, captured in his universe map the outer rings of the Milky Way, the neighboring Andromeda galaxy and other star formations, then encircled these star clusters with a ring of plasma left over from the Big Bang. Budassi told Tech Insider that he got the idea after making hexaflexagons for his son's birthday one year. Hexaflexagons are flat paper models that can be folded in certain ways to reveal faces besides the six that were originally on the back and front. With photoshop, Budassi used images from NASA based on observations made by their telescopes and roving spacecraft, and some textures created by himself. In the center of the image is the glowing sun, then each planet is placed where it is in the Solar System. The most famous map projection is the Mercator projection, which shows the Earth’s surface and was presented by Gerardus Mercator in 1569. The obstacle for astronomers trying to show a map of the universe was how to confront the challenge of a wide variety of scales. Logarithmic maps were one solution. 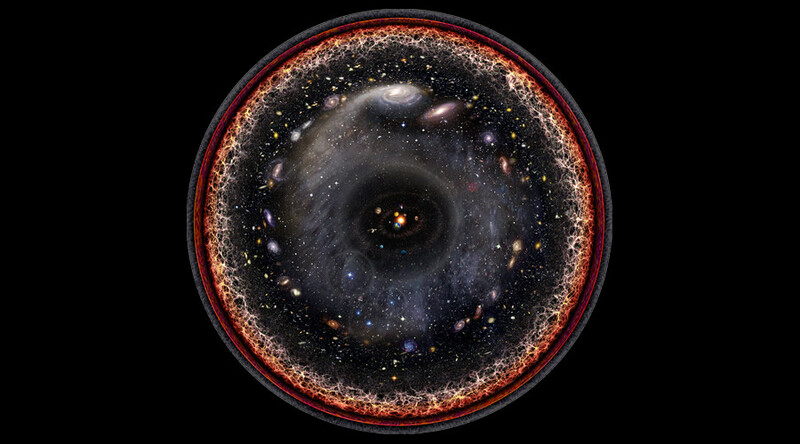 Budassi’s map is created on a logarithmic map of the universe created by Princeton University astronomers, based on data on 3 million space objects from the Sloan Digital Sky survey. Logarithmic maps let astronomers visualize extremely large areas, as each “step” on the axes increases by a factor of 10 (or order of magnitude). The Princeton team published the maps in the Astrophysical Journal in 2005.